People across Nova Scotia and New Brunswick reported seeing an unusual streak of light in the sky Saturday night. 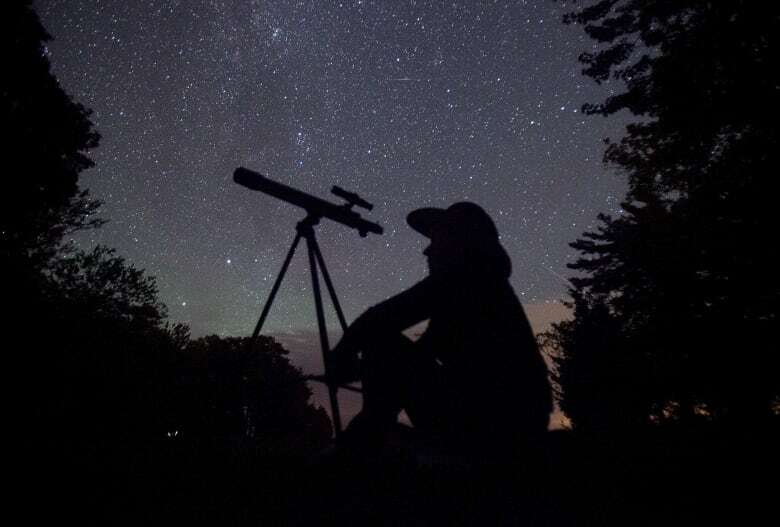 Bruce and Melody Hamilton were settling in to watch the evening skies Saturday evening when Melody spotted an unusual bright light at the edge of the northern horizon. The Hamiltons are amateur astronomers who frequently observe the skies above their home in Litchfield, N.S. Melody Hamilton said something first appeared just west of Saint John, across the Bay of Fundy. "I saw a light travelling west to east, quite a bright ball cutting a trail," she said. "But it wasn't as fast as any meteor that we've ever seen. We've seen some fairly slow ones, but this was slower. But it wasn't as slow as an airplane. It was this unusual speed … it looked like it was on fire." Bruce Hamilton compared it to seeing a bonfire from some distance. Initially, they thought it might have been an aircraft. Based on the colour and speed though, they said it could have been a fireball with an orange hue, and there may have been debris falling off of it. The Hamiltons, who were watching from their darkened home, were among the many Maritimers who spotted the bright light, which was captured on Saint Mary's University's observatory sky camera around 7:30 AT. Charles White, who like the Hamiltons is part of the Royal Astronomical Society of Canada's Halifax centre, said in an email that it can be difficult to determine exactly what people spotted. He said it could have been a piece of space junk burning, or a meteor. The orange glow would indicate something containing plenty of iron was burning up as it travelled through the atmosphere. A organization that compiles fireball sightings around the world received 57 reports, including some from Maine, eastern Quebec and all three Maritime provinces. In northern New Brunswick, Jonathan Pettigrew grabbed his phone to record when he noticed something shooting across the sky. Moments before spotting it, Pettigrew had been speaking about his mother, who died two years ago. He saw it as a sign. "It was quite amazing, actually," he said. "It seemed so close. You could even see it looked like sparks … on the tail of it. It was getting brighter. It was quite interesting." Pettigrew said it was visible for at least 40 seconds. Geoff Cormier was on his deck in Amherst, N.S., when he spotted what appeared to be a fireball flare in a clear sky north of him. He said friends gathered to speculate about what it was as the light moved east. He captured a second video that includes what he believes was the same light in one place flashing, leading him to dismiss that it was a meteor. "We thought it was like some sort of plane," he said.